Welcoming June, I'm trying on a new foundation routine. Previously in my daily basis make up routine, I use the Revlon PhotoReady Foundation. The foundation covers so well. However, during the afternoon, my face gets super shiny. So I do a small research on foundations that is highly recommended by most beauty gurus that has oily to combination skin. 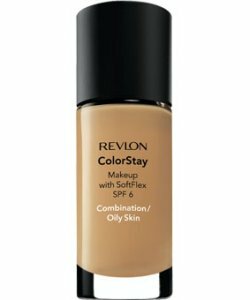 It concludes, that the Revlon ColorStay Foundation for Combination/Oily Skin has the most features and also it is the most affordable foundation recommended out of many other brands. So I decided to give it a try. The color that I decided to purchase is in 200 Natural Beige. I purchase my Revlon ColorStay Foundation for Combination/Oily Skin in Galeria Mall Yogyakarta since it was the nearest to my office. The cost of a tube of the Revlon ColorStay Foundation for Combination/Oily Skin is IDR.108.000 (around USD.11). For a drugstore quality foundation, this is quite a reasonable price. The packaging is a glass bottle with a plastic black lid. Since it is a glass bottle, it is quite heavy. This makes it less convenient to be carried for travelling. Plus, it is quite dangerous if I accidentally drop the bottle. It may break down into peaces and "obviously" will hurt me. However, above all that, the heavy glass packaging in my opinion makes the product looks exclusive in some manner. The Revlon ColorStay Foundation for Combination/Oily Skin does not have a pump. So it's quite difficult to control on the amount of foundation I wish to apply. I have to be extra careful when putting the liquid product into my hand in order to make sure that I don't waste too much excess product. Honestly, I prefer foundations that has a controllable pump which ensures that 1 pump will be enough for my whole face. Revlon ColorStay Foundation for Combination/Oily Skin promises the feature of 24 hours long stay. It also said that it has a SPF 6 in the foundation. Even though it said that it has SPF protection in it, I don't recommend you to rely on the SPF in it. Plus, SPF 6 I believe it's not enough for a great complete protection. The total content of the product inside is 1 Fl Oz or 30 ml of product. In my opinion, this amount is a fair amount of product that for me will be able to last for 1 to 2 months in an everyday basis usage. The Revlon ColorStay Foundation for Combination/Oily Skin promises a matte finish that will be very suitable for combination/oily skin type. However, I really like the texture of the foundation when it is being applied to my face. Since it is not too thick on the consistency, it is very easy to evenly distribute and apply. I use a brush in applying the foundation. The most disturbing thing from the Revlon ColorStay Foundation for Combination/Oily Skin (aside from its "no pump" bottle) is the smell. It has this very strong foundation kind of smell that I really dislike. However, this strong smell exists when I smell the product right from its tube. But when I apply the product to my face, I don't find the smell too disturbing. In order to do this review, I do not use any additional moisturizer, sun cream, or make up base. I wanted to see the actual effect of this product. A little really goes a long way. One layer of the product in my case is already enough to cover my complexion and redness. I might conclude that it gives a medium to high coverage. It does not itch during the day which is a good sign. My face is extra sensitive so it will easily itch when the product does not match my skin condition. I did not use the product for a straight 24 hours since obviously it will be unhealthy for my skin. However, I've did an experiment on this product for a good amount of hours. At around 10:00 I see that the coverage is still very great. It still have a matte finish to it. The shine in my nose and cheek is not oil. It is the complexion from the blush on I use that does not have a matte finish. At the end of the day about 20:00, the coverage on my chin area looks a bit fading since it shows a bit of my freckles in that area. My forehead also show the pimples that I got. However, redness and dark complexion in my cheek is still fully covered. I felt that the matte finish still exists. However, I feel sight oil in my T-zone area. You look really nice with this foundation on! And I know what you mean, the smell is a bit off putting. Apart from that I do regret it doesn't have a pump.. So I am still looking for my holy grail foundation. I have just tried a foundation finder by ps beauty and this website recommended that I try estee lauder double wear light, has anyone else used it? @Devi: Aku belum nyoba yang whipped cream. Hihihi..